Sirene Belek Hotel is rated 4.9 out of 5 based on 8 verified reviews from YGT customers. In an unbeatable beachside location at the heart of the Belek’s golf course-studded coast, the Sirene Belek Hotel is a paradise for holidaymakers looking for a luxurious all-inclusive break under the Turkish sun. 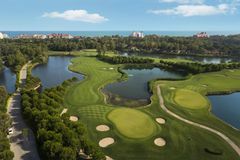 This opulent 5-star resort lays Belek’s many outstanding golf courses at your feet, including the fantastic PGA Sultan and Pasha courses at Antalya Golf Club. Located less than 30 minutes from Antalya Airport and only 10 minutes from central Belek, the resort is close to all of the local attractions in the unlikely event that you want to leave this beachside haven. Sirene Belek Hotel is ultra all-inclusive, so you can be confident your every need will be met, whether you are by the pool or in one of the five great restaurants. Book a group of 8 or more for a minimum of 7 nights and receive one free place. We found 15 offers matching your search. To give the course its full title, The PGA Sultan Course, provides a test of golf which is sure to test all who stride along its manicured fairways. With the likes of Tiger Woods, Rory McIlroy and eventual winner Justin Rose, playing the course in the Turkish Airlines World Golf Final, it is safe to say that the European Golf Design & David Jones designed layout has been made with tournament golf in mind. The Sultan Course is a ferocious test, where the challenging holes wind through the landscape's impressive pine forests. From the championship tees, the course measures 7,011 yards, and will ensure a formidable examination even for the low handicappers. Spectacular views and challenging hazards are the hallmarks of the Sultan Course, which is one of Belek's finest. The Pasha Course is the second at the Antalya club, and is a more appropriate proposition for the average golfing visitor. While it benefits from the same brilliant views as the Sultan, its full length of 6,267 yards makes it manageable for everyone. The advantage of the long hitters is nullified around the Pasha, whose defence is its tricky dog-legs, sloping greens and strategically positioned bunkers. More of a ‘thinking man's' course than its neighbour, the Pasha is the perfect foil for the lengthy Sultan layout, which is why the Antalya Golf Club has something for everyone. The Sirene Golf Hotel is the perfect blend of sun, sea and golf, which is why it is a real Belek favourite. The Mediterranean waters, with their stunning azure hues, lap at the resort's shoreline, so sun-seekers and beach-lovers are in for a treat, as well as golfers. The 6-storey main hotel and the 5 surrounding villa blocks combine to offer a total of 442 guest bedrooms, all of which are extremely spacious, and are equipped with air-conditioning, satellite television, safe deposit box, mini-bar, bathrobe and a private balcony or terrace. The excellent facilities and the convenience of the ultra all-inclusive have helped Sirene jump to the head of the Belek queue for outstanding golf holidays. The amazing facilities at the Sirene resort are a real attraction; guests can make use of the Olympic-standard indoor and outdoor swimming pools, the spa and health club that includes sauna, Turkish bath, jacuzzi and gymnasium, while tennis courts and jogging trails are also available. Of the Sirene resort's five restaurants, the flagship Kymbele dining room comes highly recommended. For some after-dark action, there are seven bars, as well as the Blacky nightclub. Eight ladies on an all-inclusive golf trip to Turkey could be a recipe for disaster, but not so at Sirene Belek Resort & Spa. This was a delightfully fabulous, value-for-money golf trip which will stay in our memories for a long time. The holiday overall ran like clockwork, with flights and airport connections all excellent despite heavy snowfall before leaving the UK. Our arrival at the hotel was very welcoming and the first impressions were very impressive. Our allocated double rooms were spacious and well equipped, with the added surprise of a mezzanine floor and a bathroom each. The decor was excellent, with comfort and cleanliness obviously at the top of Sirene's 'must provide' list. The dining experience was also excellent with numerous choices in the International Restaurant for all three meals. We also thoroughly enjoyed our dinner at the Italian Restaurant which we booked one evening. The selection of wines at lunch and dinner were very palatable and suited everyone's taste. After dinner, the atmosphere in the bar areas was very warm and friendly with very pleasant waiting staff on hand. Transportation to and from the golf courses ran perfectly, and as for the golf courses themselves, both the Pasha and Sultan were in excellent condition, very attractively laid out and appropriately challenging. The clubhouse was a very comfortable place for a drink after a round with the normal discussions on how we all played, how many balls we had lost and which specific lake claimed said balls! On the days we were 'resting' from golf, we thoroughly enjoyed the other facilities at the hotel, particularly the spa, where the massages available were 'to die for' and eased many an aching muscle! As a group we have been to other golf resorts in Belek and for us the Sirene gets top marks and is on a par with the others. It is high on our list of places we will visit again and YGT are to be complimented for having this hotel on their books. Ladies can sometimes be difficult to impress but this bunch of 'Golden Girls' will be back! We pick this hotel each year because of its access to the Sultan, for us it is a must play in Belek. It is difficult but very fair and hugely enjoyable to play. It is just a short buggy drive, reception will take you to the clubhouse, it takes a couple of minutes. Both courses are walkable which is a real plus given how long a lot of the overseas courses are. The rooms are large and have recently had a refurb so they have a modern feel to them which is nice. Restaurants are good with plenty of options for dinner, we really enjoy the buffet restaurant as there is lots to chose from which makes it easy to please our group of golfers. The all inclusive option is extensive with imported drinks on offer, again for anyone in your group who might be fussy, I'm less so and always happy with a local beer! We played the Sultan, National, Tat and Pasha, all of which were in superb condition. The National is hosting the Turkish Ladies Open next week so you can imagine it was in great nick. All the staff were very friendly so I would definitely recommend Your Golf Travel to friends. Now all I have to do is persuade one of my mates to repeat the trip next year!! This is the second time we have booked a golf break to the Sirene Hotel and will definitely be going back again next year. The hotel was as good as ever, room, food and drink excellent, evening entertainment enjoyable and staff helpful. Being all inclusive the good thing is that once you are there you don’t need to get your wallet out! It’s a great place to make new golfing friends. We played the Pasha and Sultan courses which are in superb condition and seem to be getting better every year, they really bring out the good golf in you, and although the Sultan is very tight and pushes you to the limit the Pasha is a bit more forgiving. This year we decided to get married while we were in Turkey and that made it even more special to us. We had a fantastic time and can’t wait to get back there! We all had a great time here, the hotel was top class, the food was excellent, the room was probabally the best holiday room we have ever had, brilliant. The Staff were very polite and allways had a smile on their faces. We all played some good golf on the courses, which were in fantastic condition, quite a few birdies too... which made the beer go down better at the 19th hole!. The transfers to and from airports were bang on time. Overall verdict is 10 out of 10. I would recommend YourGolfTravel to friends, look forward to booking our next golf holiday with your company. This was our second time at the Sirene Hotel and the food and atmosphere were great, our flights too were the best I have experienced in recent years. We played on the Pasha, suitable for all level of golfers, and Sultan, for the better golfer, courses and their condition was exceptional. I think Your Golf Travel’s service was excellent and we are grateful for suggesting a golf holiday in Turkey which we had not visited before...it was fantastic! The Sirene Golf Hotel was excellent value for money. The food was of a very high quality, our room was spacious and had all of the amenities one would expect from a five star hotel.The hotel was very well staffed as well and all were very attentive and efficient. The golf courses we played were all well laid out with excellent clubhouse facilities. We enjoyed the Pasha course the most and found the plan on each tee very helpful. The Sultan was more difficult, especially as there were no course maps. We have already recommended Your Golf Travel to our friends and will continue to do so. The golf break was brilliant and the value for money on our all inclusive golf break package was outstanding. Just got back on Saturday from a wonderful week at the Sirene Golf & Spa Hotel and wanted to thank you for all the work that went in to organising our Turkey golf break. The Hotel was first class and the staff were bending over backwards for us! We were a group of 4 Ladies on a golf holiday and the service to and from the hotel with our clubs was exceptional. Transfers were on time and very friendly and courteous. After leaving our clubs at the drop point we never had to worry about them again and they were awaiting our arrival on the first tee for each of our rounds of golf. The Food was spot on as there was a great variety and it was of the highest quality. The Rooms were spacious and very well appointed along with the bathroom - and very clean throughout the whole resort. We played two rounds on the Pasha Course and two rounds on the Sultan Course which were both beautiful golf courses. The Sultan course was very difficult due to the sheer length but was very enjoyable none the less. The Pasha course was far more manageable for our group and we even had a few birdies flying in! Both courses are very beautiful and are maintained supremely well. The facilities at the hotel were great and we pampered ourselves at the spa every evening before getting ready for dinner. The service we got from Your Golf Travel was first class and we have absolutely no complaints whatsoever. Everything we asked for was taken care of your advice and organisation was brilliant. We had a fantastic time playing golf in Belek and will be back in touch for our future golf holidays.